One of the principal results of Catholic martyrdom in China was the increased indigenization of Christianity. During the reconstruction of mission churches, hospitals, and orphanages after the hostilities of the Boxer Uprising (1898-1900), the Roman Catholic tradition of venerating martyrs was attached to the reinvigoration of Christian communities. Not only did Catholic architecture accommodate Chinese sensibilities, but causes for sainthood were also begun at the Vatican to add Chinese names to the Church’s list of saints. The implications of Clark’s work extend beyond the subject of Christianity in China to the broader fields of cultural, social, economic, political, and religious history. This pioneering study follows the trails of Western missionaries and Chinese converts as they renegotiated the religious and cultural chasms that existed between the West and China, and it demonstrates that these differences resulted in two very different outcomes. Whereas converts appear to have bridged the cultural divide, often to the point of self-sacrifice, political and cultural tensions on the macro level sometimes ended with forceful conflicts. This book contributes to a deeper understanding of cultural and religious interaction, and provides an account of a heretofore unstudied chapter in the history of Christianity on the global landscape. Clarke's work is important research, in that hither to little know or largely forgotten histories have now been gathered together for the perusal, and benefit, of all. The work will be of interest to teachers and students of religious studies, Asian and Chinese history and cultural studies, amount others. Based on thorough archival studies, and a profound knowledge of Chinese culture, this book not only contributes substantially to the comparative study of Christian martyrdom but also to the understanding of enculturation. Still, this English-language portrayal of some of China’s Catholic saints, the discussion of martyrdom in the Chinese context and the processes involved in preparing martyrs for beatification and canonization will appeal to the general reader. That this book targets a wider readership is indicated by the author’s decision to Anglicize the given names of continental European missionaries as well as by his use of the colloquial term “nuns” instead of the canonically more accurate term “sisters” for the martyred Franciscan Missionaries of Mary. 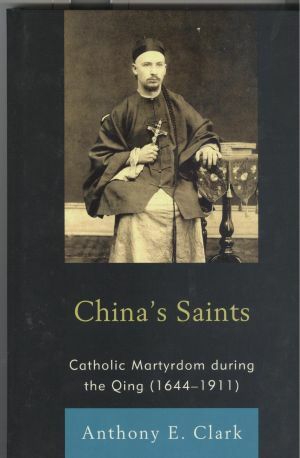 China’s Saints is an original and insightful study that examines the transmission and appropriation of martyrologies within the Catholic Church….Using martyrdom as an analytical tool, Clark reinterprets the indigenization of Catholicism, the frequent outbreaks of church-state conflicts, and the Catholics’ responses to state persecution. His findings throw light on the production and reception of the martyrologies, and the transformation of Christianity from a heavily persecuted religion into a fast-growing spiritual movement today…. When reading China’s Saints, it is hard not to sympathize with these courageous individuals. Its engaging style and readability should appeal to everyone. This is a well-crafted book that provides the first English narrative of most of these martyrdoms. The inclusion of the controversy that erupted after Pope Saint John Paul II canonized the 100 martyrs on October 1, 2000, shows that the cultural differences and misunderstandings that lay at the roots of many of the martyrdoms in the earlier centuries still exist.